Humanitarian Crisis: There is a severe shortage of low-barrier transitional shelter, affordable housing, and supported housing in San Francisco and throughout the Bay Area. Mission: As a City, region, state, and human family we are tasked with ending the crisis conditions of street homelessness for thousands of our unhoused neighbors. ➣ Supported the development, building, and distribution of mobile "tiny home" emergency shelters designed to meet National Fire Protection Association Standards for small RVs. ➣ Developed and piloted a community-integrated transitional village model for 1 year at the Impact Hub in SF's Mission District. ➣ Organized with current/former unhoused/curbside residents, impacted neighbors, and city/region-wide organizations and volunteers. ➣ SFHC leadership, collaborators, and volunteers have coordinated large service events with hundreds of unhoused and housed participants and volunteers. ➣ Created health, safety, and good neighbor agreements. 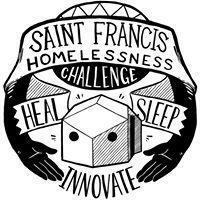 Saint Francis Homelessness Challenge is fiscally sponsored by Intersection for the Arts.